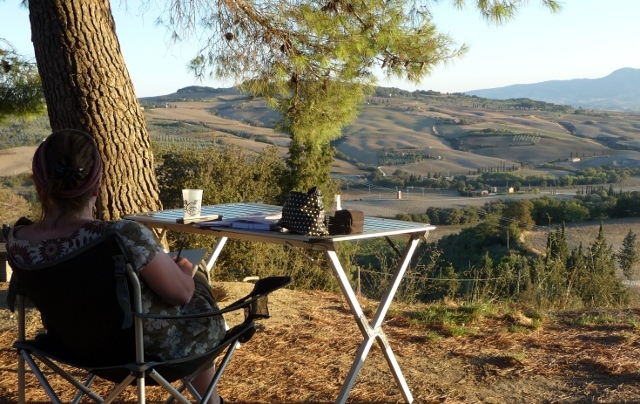 We left Siena with mixed feelings – we’d just about had enough of the campsite (as we seem to have had with every site we’ve spent more than a couple of days at – does the perfect campsite exist? ), but we’d really enjoyed the city. The landscape almost immediately quashed any doubts, though – the “Crete Senesi” is something slightly different. It’s sort of a blend of stereotypical Tuscan, with tall lone trees in almost child’s-drawing-straight-even lines and hill towns against a backdrop of vines, crossed with a moonscape. I have no idea how they manage the fields, since the ground just doesn’t appear to go in the same direction for more than a few metres without diving off at random. Bagno Vignoni gave us an opportunity to partake of sulphurous hot springwater – not, unfortunately, in the large and beautifully situated pool in the town centre (closed for bathing for the last couple of decades – and unfortunately looking a bit stale and green as a result), but we could at least sit with our feet soaking in the body-temperature millstream as it headed off. The town’s (as usual round these parts) on top of a steep hill, and for centuries the full advantage was taken of both the temperature (closing on 50deg as it emerges from the springs), but also the altitude. After the water had been through the health spas, it then passed through some very cleverly designed channels and mechanisms to power the town’s mills. Now, it’s just the odd expensive-looking (closed for the afternoon) spa that takes advantage. 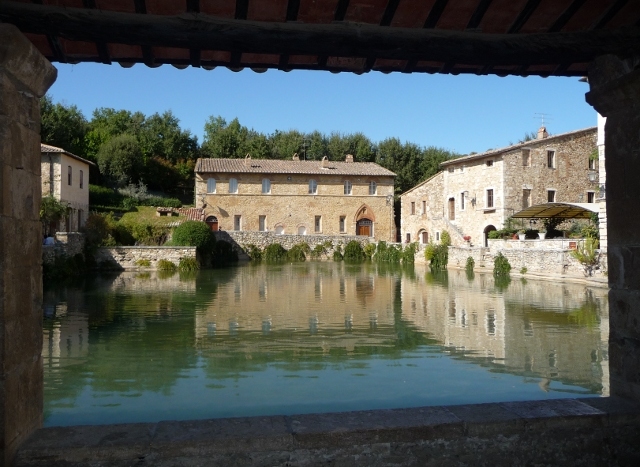 Popping into the tourist office at Pienza did give us one major stroke of luck, though – details of an agriturismo with camping, just outside town – Podere Il Casale. There’s no way we’d have found it on our own – several kilometres off the main road down a dirt track, without a single sign to indicate its existance until you got to the actual gate. We’re immensely glad we did, though. Pointed to a space on the very edge of the steep hillside, with easily the best view we’ve had from a pitch on the trip so far, we started to settle in – with the help of a multitude of wildlife. Cats, dogs and peacocks roamed freely around the site. Below us, the soundtrack of donkeys – one in serious need of oiling – mixed with the sheep and goats. 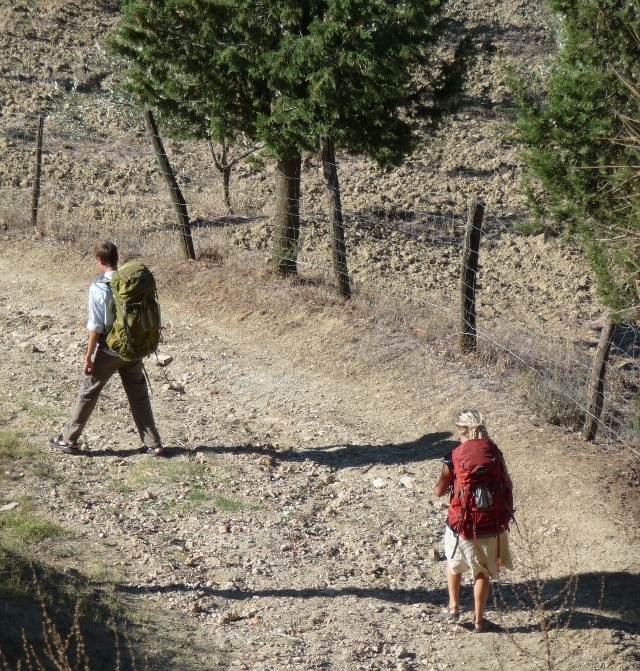 We watched as two backpackers trudged up the dusty track – only for them to turn out to be Zac and Virginia, a pair of Texans we’d got chatting to on the bus in to Siena. A very pleasant evening’s nattering ensued. Zac & Virginia, heading away in the morning. In the morning, after the (included!) breakfast of home-baked bread and home-made preserves (pear jam – mmmm! ), we said our goodbyes and headed off in the direction of another wine town – Montepulciano – not to be confused with the much better known Montepulciano d’Abruzzo. As we arrived, half an hour later, we mused gently upon the difference between travelling by foot and by car. Zac and Virginia had taken two long, hot, hard days to trek from Montalcino to Pienza, and were looking to get to Montepulciano by that evening. We could have knocked the lot off in an afternoon – and the views from Montepulciano stretched past Pienza all the way to Montalcino. They’d obviously got much closer to the landscape than we had – but we had the opportunity of tasters of a much wider variety of landscapes. One thing’s for certain – chatting to them made us want to get a bit more hiking in. Montepulciano was our last stop in Tuscany. Winding eastwards, we crossed into Umbria. One thing that we’ve noticed in Italy is that there’s not been any indication whatsoever that you’ve crossed between regions. No sign, nothing. You just go to check up on the next town in the guidebook, and find yourself in a different chapter. 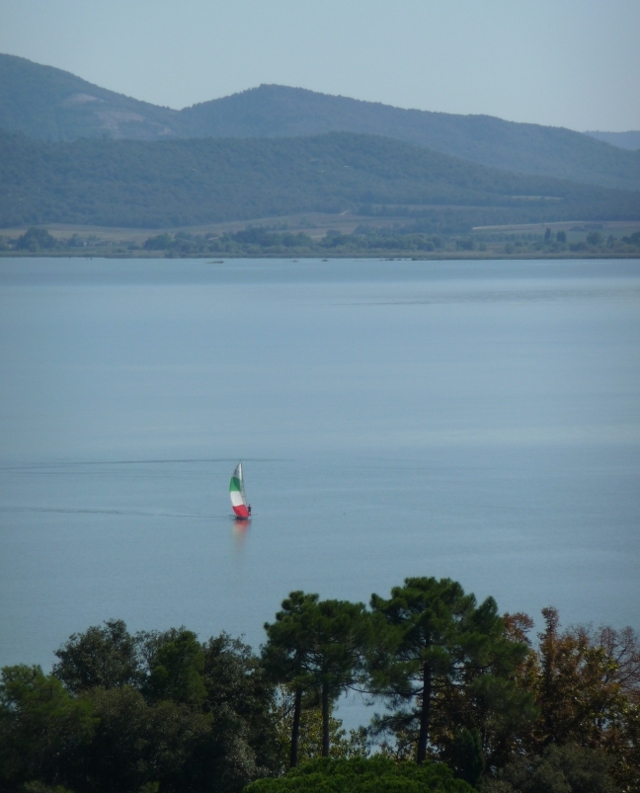 Castiglione del Lago sits on the shores of Lago Trasimeno, the biggest inland stretch of water on the Italian peninsula, apparently. It’s an impressive site, with a fortress rearing up on a chunk of rock – clearly visible from the opposite shore, once we got there. The welcome we got in the town was warm – almost physically dragged into about the first shop we passed, to taste wild boar prosciutto and salami, then an assortment of truffle products, all washed down with a number of different wines and a friendly chat. Effective saleswomanship, too. A picnic lunch down on the shores of the lake was enlivened by watching somebody fooling around with what appeared to be a radio-controlled coffee table, to general hilarity from all around – including those whose fishing lines it was getting tangled in. From there, we continued past Perugia towards Assisi – of which more later.